Yesterday was the first official day of the 2016 edition of Making Learning Connected MOOC (or, CLMOOC) and the call for introductions (you can dip in, swim in or dive in) has already led to many people reaching out to connect. The themes of this short MOOC — just three Make Cycles and one Rest Cycle — are Cultivating Connections, Reciprocating Connections and Celebrating Connections. Please come join us. The entry points are designed to meet your comfort levels, and you are welcome to observe from afar, if that works for you. Whatever your level of participation … is the perfect level of participation. You can get more information at the CLMOOC website, which includes a place to sign up for news. Look at the headlines of the newspaper. Watch the news. 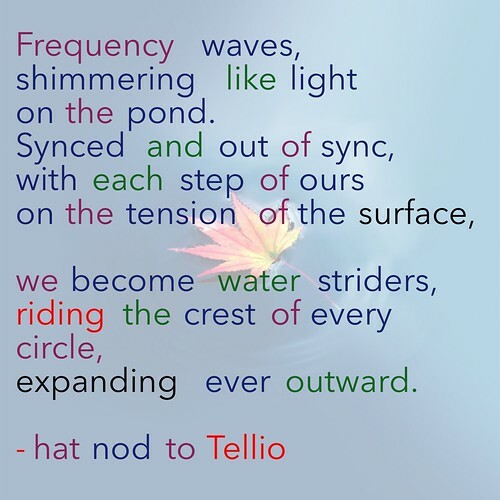 If ever there was a need for more deeper connections and better understanding of each other, and our different worlds, now is the time. No, the CLMOOC can’t solve race or religion issues, or change socio-economic divisions, or end war and famine and all of the terrible things that seem to consume our energies on the world stage. 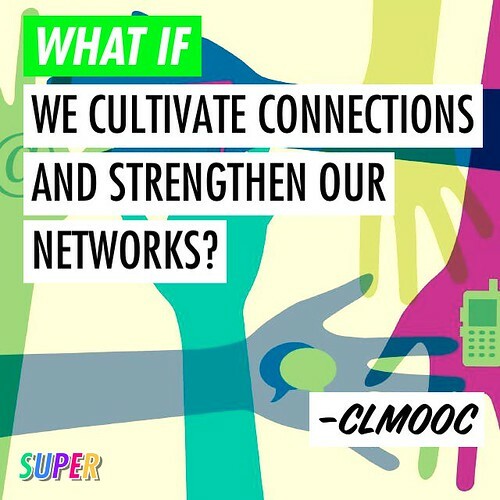 But maybe CLMOOC, and other spaces like it, that are built on the ideas of CONNECT can help some of us feel a bit less isolated, a little less alone … maybe we become more part of the World in a meaningful way. Maybe it opens up a path to conversation. Maybe cultivating connections with those outside your normal circles, and reciprocating ideas beyond the easy yet fairly surface instincts of the +1 and the “thumbs up” or the “heart,” and celebrating what makes us diverse while also acknowledging common ground … maybe that is where we start. And if you are an educator, maybe connecting with others in the world is where we remember to value each other, including our students and their families, a little bit more … and bring those ideals back to our classrooms in a new light. Maybe. There are so many ‘maybes’ in what I wrote. One can be hopeful. One has to be hopeful. I’m trying. You? … stepping down from the soapbox now. The first Make Cycle started yesterday and moves throughout the week ahead (with a few live events). There are sharing spaces on Twitter, and on Google Plus, and on Facebook. And probably other spaces, too. Who knows? That’s the beauty of an open networked learning adventure. And this summer, with the National Writing Project and Educator Innovator working on its Letters to the President 2.0 project (which is definitely worth your time, too), the CLMOOC is being planned and facilitated by a crowd of participants. 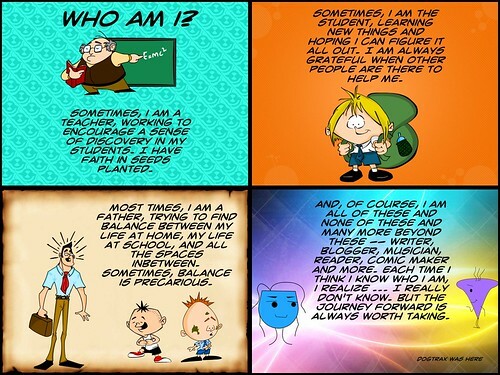 I’ve been doing introductions of various flavors over the years with CLMOOC and the act of taking a step back reminds me of how complex our lives are. I tried to capture that idea in this comic that I shared out yesterday. 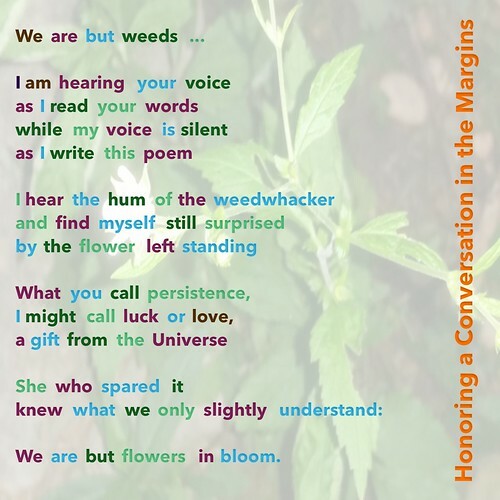 Terry Elliott used the sharing of photos and the #silentsunday tag the other day to write in the margins of his blog (with the Hypothesis annotation tool) about a flower left standing in the weed patch and invited readers into the margins, too. I went in, wondering, and planted a few poems along the way around his use of the One, Two, Three, Four. Terry then posted a second post at his blog, in which he sought to differentiate “the signal from the noise,” this time providing a space in the collaborative Hackpad for folks to add to the writing from the margins. It was as if he had clipped a few buds, and put them in a vase, and invited the world to add some more flowers. So, I did. This time, I focused on the element of the story of his wife, saving the flower that became the image he shared for #silentsunday that kicked off the whole shebang. What I like about this playfulness is the give and take, and the way Terry hid his writing away from the image, and that by stumbling into his story of the flower in the margins of the text, I was inspired to write, too. Not just inspired; Invited. And the notion of taking the writing from the margins, and pulling it back into a post, open to the world, is the sort of connecting spirit that I seek out as a writer. 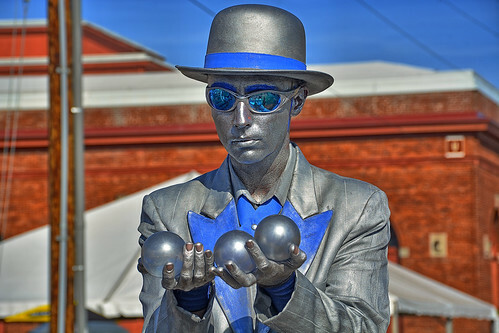 We’re all jugglers, using words as props. Or gardners, seeking flowers amid the weeds. Use your own metaphor. And write. I am gearing up for a extended, long weekend visit with some friends that I have known now for nearly 30 years. 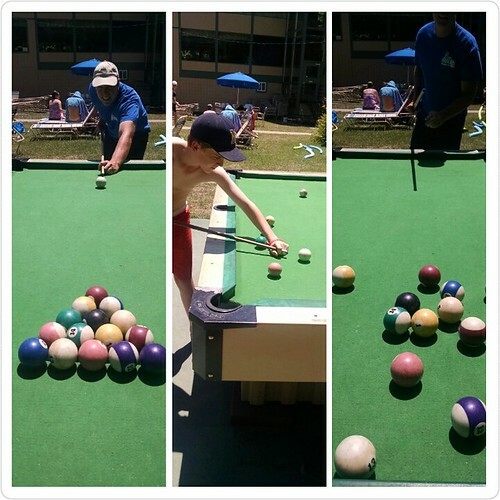 We gather together each year, from whereever we live, to reconnect, and play the Pool Championship of the World (or, our little world). Yesterday, at our neighborhood community swimming pool, I touched a cue and table for the first time in almost a year. My son is getting better, but not good enough yet to beat the old man! PS — my tag, In the Pocket, reminded me of an old song of mine from my band, Big Daddy Kiljoy. 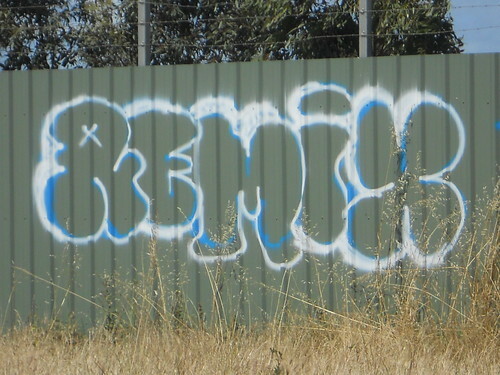 … I keep finding myself wandering back into the question of ‘who owns what’ in the Digital Age. It’s not just a question of a single item — say, a photograph, or a music file. Those kinds of issues — particularly when it comes to livelihood of an artist — are important and still being sorted out. I do think, and hope, that elements like Creative Commons licensing helps delineate lines for those of us who create (and may need to protect some of our art) and those of us how like to use art of others to create something new (and may need to learn better how to note where the original came from). I’m thinking more of ideas here, and who owns the idea. If I spark a discussion in online forums and along various hashtags, or if I launch a collaboration that others take part in, do I own that idea from now to forever? I think about the poems I have invited others to write into, and various media projects that I have opened the door to, and other projects that I have been involved in. The spark has always been collaboration, not ownership. I know I may be unrealistic but ..
… once the idea is out there, I figure it’s no longer just mine to do what I want with. I’ve given it, as a “gift” of sorts, to the world (and in my case, the world might only be a few people), which may very well completely ignore the idea or it might remix the idea into something different entirely. It may even call my idea the same name I gave it. Or not. It may give me a heads up about its use of the original. Or not. But it’s not really all mine anymore. If I didn’t want that to happen or unfold that way, I probably should have kept the idea to myself or tried to sell it with licensing restrictions — a phrase that gives me pause even as I write it. In Corey Doctorow’s book, Information Doesn’t Want to Be Free, he uses the metaphor of a dandelion and the release of seeds to explain in a way how ideas can take root from artists and others in this age of the Internet. The dandelion doesn’t care about where the seeds go, or even if the seeds become flowers. 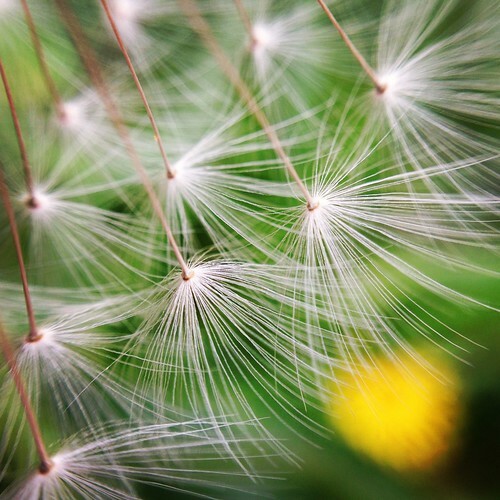 What the dandelion cares about is the spawning of new seeds and the release of those seeds to the wind. That’s where all of its energy is at. It puts faith in the notion of something will be planted somewhere, and the world will continue. Doctorow uses this metaphor as part of his argument around on how small artists can emerge as successful, or at least surviving, artists in the digital age. Release seeds (or music tracks, or photo teasers, etc) and see where those ideas flourish. If your seeds find root, your audience will find you and support you. In contrast, large organizations — such as record companies and movie companies and publishing companies — spend all of their time with their prodigy, like overprotective parents. If I remember, I think Doctorow continues the metaphor by noting how much alike large organizations are like mammals, with all of the energy in the system centered on ways to nurture and protect their progeny. We give our children our last names and then talk about “family” honor and hereditary lines. We celebrate this with family trees. I’m not saying that is necessarily wrong, but it feels at odds with the open promise of spawning ideas in the Digital Age that I believe in. I like to think of the whole DS106 ecology as one fine example of how no one really owns the ideas. I don’t personally know Jim Groom or Martha Burtis, two folks I believe were at the start of DS106. There might be others. I’ve only walked virtual dogs with Alan Levine in online spaces like The Daily Create. Others who were part of the whole DS106 shebang from the start are people I don’t quite know or remember. No offense to them, but they aren’t all that important anymore to the DS106 environment … as it exists today. 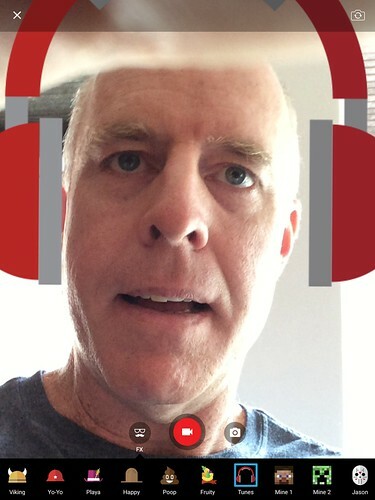 The DS106 world — with its digital storytelling and creativity focus — is there for the picking. I believe you could start a DS106 course right now, today, and connect in and it would be fine. You could set up your own version of The Daily Create, and it would be fine. Heck, I think Alan Levine will even give you the WordPress Theme to do so. There are no legal documents to sign. There are no permissions to get. Just go on and do it. 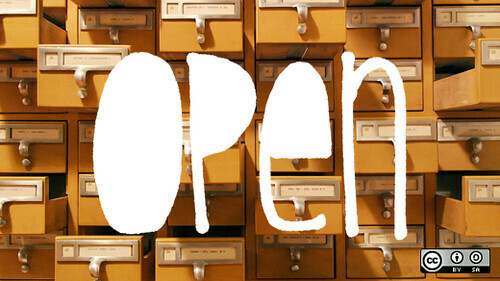 It’s an open invitation, set in motion years ago, to take the idea and run with it. Why isn’t there more of this? Why don’t more innovative ideas have huge REMIX THIS buttons? I’d love more dandelions in the digital fields of play. To be upfront and honest, though, I still struggle with this concept as a classroom teacher. As I make slow but steady movement into Connected Learning ideas with my sixth graders each year, I try to find balance between needing a certain sense of control and providing opportunities for independence for my students. I wish I leaned more than I do towards the latter. But I am learning, and I am always open to possibilities. I have my ear to the ground, as much as I am able. I celebrate the Remix and wonder at the Creativity. I don’t quibble over who owns the ideas that began it all. My youngest son (age 11) was watching an episode of Futurama a few weeks ago. In it, Richard Nixon (with his head in a jar) is talking to a crowd of people, about building a wall to keep space aliens out. A light when on in my son’s head. He remembered all the hoopla about Donald Trump building a wall. So, he started to plan out this idea of a political remix, of meshing Trump’s call for a wall on the border with Mexico with Head-in-Jar Nixon’s call for a wall in outer space. I helped him get the videos he wanted to use but he knows enough about iMovie now to do the editing and mixing himself. I was mostly hands-off. The result? Pretty cool political remix, I think, for an eleven-year-old kid who understood that he could make political commentary with pop culture elements. Of course, I am biased. He’s my kid. You’ll have to watch and see what you think. This was sort of fun. I guess. I heard about a music video mobile app called Chosen that is becoming popular with young people (after, typically, not necessarily being used in the way it was built for). Kids use it for lip-syncing videos, and the company just got rights to millions of songs, I guess. I figure it’s always a good idea to get a handle on what is becoming popular (still have yet to do Snapchat, though, so maybe take my pronouncements with a grain of salt) and so I dove into Chosen. It’s pretty simple to use. You can record your voice or music, or choose music (this is the lip-sync method). There are some funny overlays you can choose. You hit “record” and do your thing. 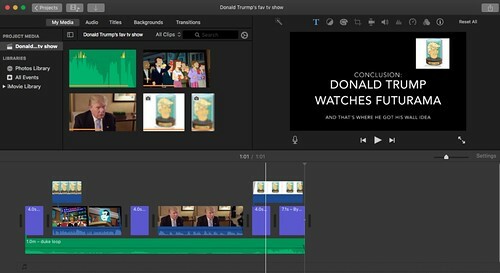 The video gets saved to your device and you can share it out. Or you can share it within the Chosen ecosystem. (Note: the folks might want to, eh, choose, a new name I could not shake a religious theme from my mind when hearing the name of the app). Give it a try. See what you think. Maybe we can do a lip-sync competition during CLMOOC? Yesterday, I wrote a bit about seeking out the writing of others and creating something new that honors those writers. I called it Resonation Points. This morning, I want to follow up on that with two more resonation points: one that arrived in the comment bin of yesterday’s post and the other that arrived in my mailbox. First, Terry (who was one of those writers I focused on) responded at the blog with a very poetic comment, with all sorts of nifty phrases, and then noted that it might be a poem. “Be watching for it on Twitter,” he said, so I did, and then we had some back and forth with poetry. He wrote about it in a way that is much better than I can write about it. 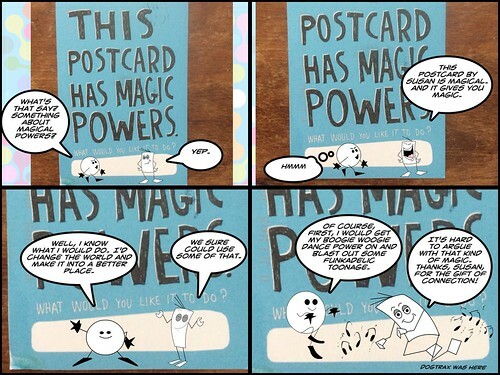 Then, I received a postcard from Susan (some of us in CLMOOC have been spending a year sending out periodic postcards … it will become part of this year’s CLMOOC, too) with a lovely message … and a challenge that I use the postcard in a comic somehow. Well, challenge accepted!